Our mission as a fraternity is to be constantly developing our professionalism. As a fraternity we participate in events such as: internal development, company tours locally and nationally, LEAD events, etiquette dinners, case studies and hosting business leaders to come speak and recruit. This year, we have exclusive events with companies such as Amazon, KPMG, Johnson & Johnson, American Eagle, TJX, PwC, Vanguard, PepsiCo, Textron and more. Not only is leadership and professionalism developed through these events, but they also provide excellent networking opportunities for all the brothers of Delta Sigma Pi. If your corporation is interested in partnering with Delta Sigma Pi for a professional event, please contact Sabrina Knott at smk5987@psu.edu. 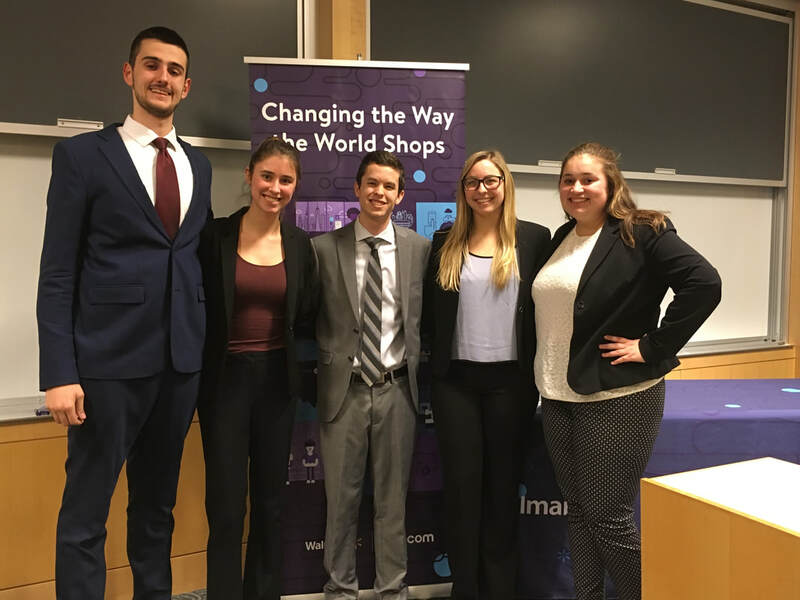 Brothers Marko Milovic, Tatum Bair, Dylan Hunziker, Sydney Jones and Mary Sommers after winning the 2018 Walmart Case Competition. Delta Sigma Pi is committed to developing well-rounded business leaders who will not only succeed in their careers, but also give back to the community. Service is one of the guiding principles of our fraternity. In recent semesters, we have volunteered at the Shaver’s Creek Maple Harvest Festival, PAWS animal foster care, food drives, the Jared Box Project, and multiple blood drives. We are continually looking for ways to foster stewardship throughout the community. As a fraternity, we hold events to financially support the betterment of our brotherhood. We solicit funds by planning events such as Coldstone Creamery fundraising night, March Madness bracket, and competitions against other business fraternities. The funds we raise will go towards better professional events, costs for leadership conferences, and other various activities within the fraternity. The Alpha Gamma chapter prides itself on providing a well rounded experience for its brothers. In addition to professional, community service, and fundraising activities, we also have a strong social aspect to our brotherhood. These activities foster goodwill and camaraderie among our members, and provide everyone with an opportunity to get to know each other outside of formal settings. During pledging we hold socials on a weekly basis as a fun way for brothers to interact with new pledges. In addition to our regular socials, we also have a wide range of other events throughout the year. Some examples from the fall include: football tailgates, intramural sports, Poker Night, and DSP Olympics. We also host formals at the end of each semester to celebrate each brother's commitment to the fraternity. Needless to say, Delta Sigma Pi offers a little bit of something for everyone.